Hot Curry Pickled Cauliflower and Stout Beer Jelly; Two Quick and Easy Gift Ideas. Last Christmas’ gift giving was Jammathon 2010. I made about a dozen different fruit jams and handed them out to anyone that was on our Christmas list. This year I wanted to mix it up a bit. After spending some time on http://www.reddit.com/r/canning/ I found some simple recipes that peaked my interest. Both appeared to be relatively quick and easy, unique, and a bit on the exotic side. First I tried Hot Curry Pickled Cauliflower; which I found at http://www.handjobsforthehome.com/2011/12/curry-pickled-cauliflower. I modified the recipe slightly by quantity. I’ve made the recipe twice now. 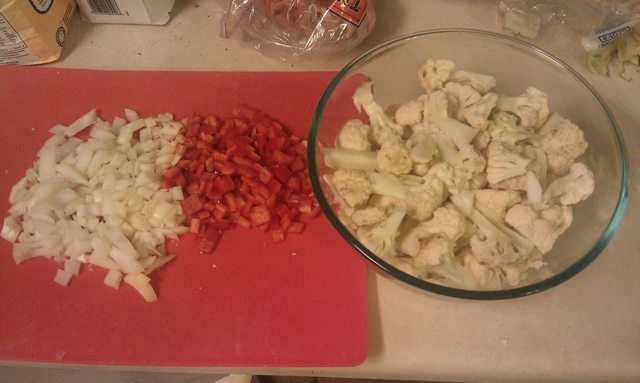 The 1st time I had a head and half of cauliflower. The 2nd time I had 2 smaller heads. Start by cutting the Cauliflower into florets. Try to keep them approximately the same size, try to keep them bite sized, and remember that they need to fit neatly into your jar. I cut the larger florets into smaller parts. Dice the onion and the red pepper. In a large pot combine the vinegar, water, brown sugar, curry and salt. On a side note, don’t brown sugar measurements seem somewhat arbitrary? It seems that as long as you keep applying pressure, you can keep packing more sugar into that measuring cup. Anyway, stir all that together over high heat and bring it to a boil. 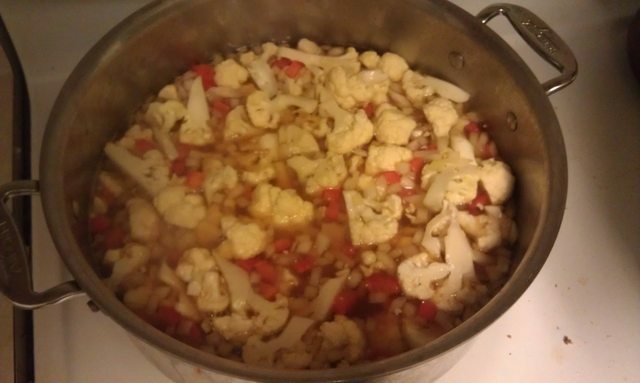 After the liquid boils, add the vegetables, stir, and boil again. After the liquid returns to a boil, allow it to simmer for 3-5 minutes. You want the vegetables to soften, but remember that they will cook an additional 10 minutes in the canner. 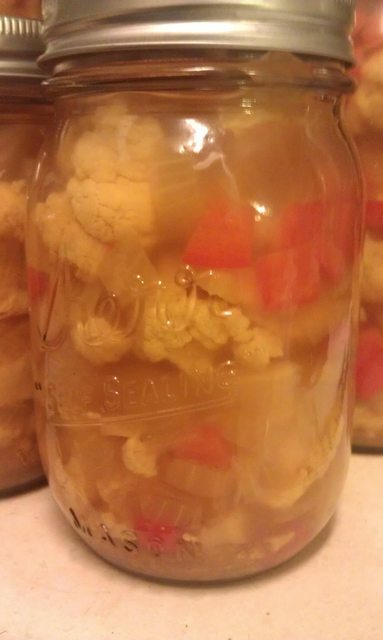 Fill your clean and sterilized canning jars with the vegetables and brine, remembering to leave your head space. Process in a water bath for 10 minutes for pints. I upped the time to 20 minutes for quarts. I made the pints to give away, and the quarts to keep. My wife loves spicy stuff like hot pepper mixes, spicy pickled vegetables, etc. 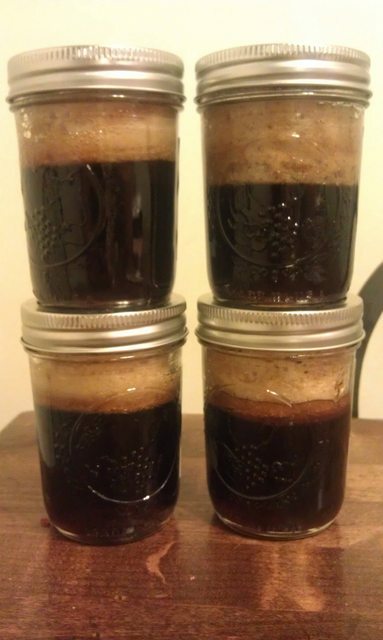 Next I tried my hand at Stout Beer Jelly that I found over at http://growitcookitcanit.com/2011/03/17/stout-beer-jelly/. First off, a warning. Seriously. Use the biggest pot you own. You’ll think to yourself “24 oz of beer? How much could it make.” You’re wrong. When you grab your medium stock pot, put it back, and grab the biggest damn pot you own! The original recipe said “It will be very frothy, that’s normal.” This is an understatement. It’s like saying that Jolt Cola “May cause some excitement in children.” The reaction that occurs when you combine beer, pectin and heat creates what I thought was a movie prop from Ghostbusters. You have been warned. 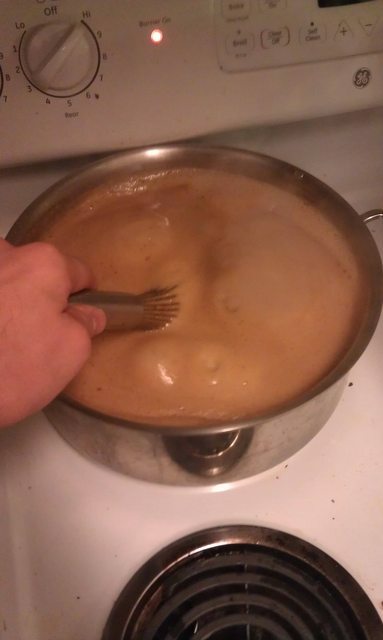 Add your 2 bottles of beer, and your box of pectin together and heat to a boil, stirring briskly. Allow it to boil, and continue boiling for 1 minute. Then add the sugar, all at once. Bring it back to a boil. And watch in terror as the volume creeps to the top of your pot as you stir with such vigor that your arm starts to cramp. Boil for 2 more minutes as you artfully dodge volcano like explosions of your hot alcoholic sugary concoction. If you did not heed my warning you are now cursing your poor decision as it boil all over your stove. FYI, if that happens, it will create a horrid smell. Just use the large pot for god’s sake. Remove the pot from the heat. This will quell the foam monster. Ladle the jelly in to your clean sterilized jars. 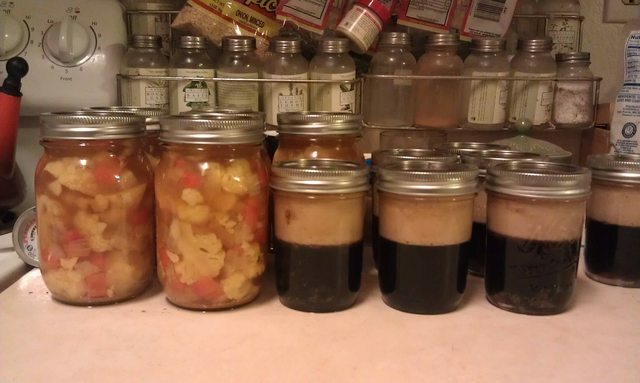 I suggested spooning one ladle full in each of 5 jars, and then returning and topping off each jar again, as they tend to lose volume as the bubbles cool. 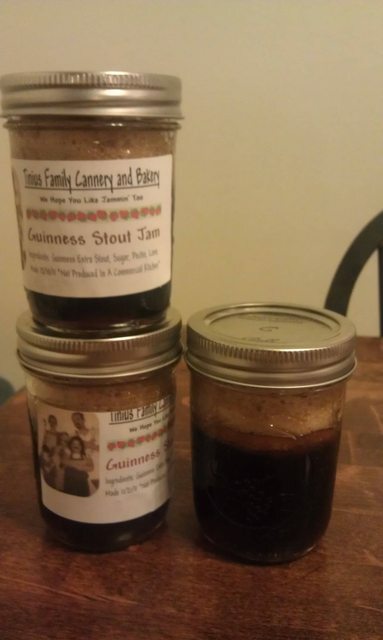 What I do love though is how the jars look like little pints of Guinness. Even after they are processed and cool. Process the jars for 10 minutes in a water bath. The original recipe suggests using this to glaze lamb, or on a fancy grilled cheese. I’m also going to try it on a rotisserie pork roast, or a cheeseburgern with sauteed onion and caramelized onions. I love making my own foods. I love canning. And I love sharing my creations with others. I think these little 20-30 minute projects are fantastic. Sometimes I feel overwhelmed with my ambitions (like right now, as I have 50 pounds of Roma tomatoes staring at me from the corner). But a quick canning project makes me feel accomplished. Not to mention that people, in my experience, are far more impressed with a hand made, home created gift, than they are a gift card. So make something in your kitchen to give out at the office party this year. 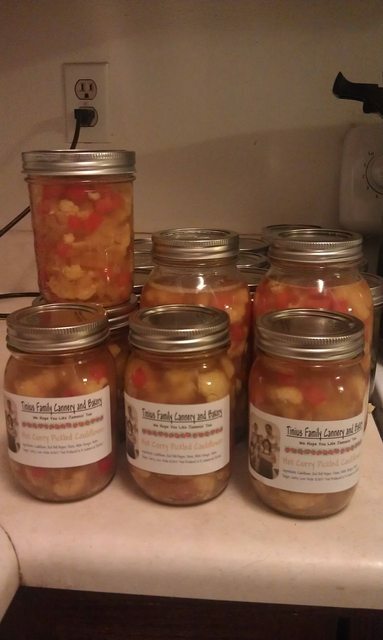 And if you have a canning recipe that you consider quick and easy, please let me know in the comments. I’m always up for trying something new.